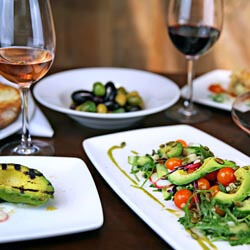 At the Los Olivos Wine Merchant & Cafe you really do get to taste the California Central Coast. Since 1995 they have taken great care in selecting each item that makes its way on your plate. Much of the produce served is farmed less than a mile away on their three acre CCOF certified organic farm. The rustic-elegance of the Cafe with the backdrop of an extensive wall of wine creates an inviting ambiance that pairs perfectly with their award-winning wine list. The Wine Merchant offers the best of California Central Coast wines and other notable wines from around the world. The knowledgeable and helpful staff of the Wine Merchant is always available to guide you in finding a wine that is sure to fit your palate and pocket. The Los Olivos Wine Merchant & Café reflects the essence of Los Olivos wine country in every way.